While small in size, Pancopia’s impact is immense. As an environmental and energy engineering company, they focus on wastewater treatment and research and development projects, including contracts with NASA, the US Navy and the City of Norfolk. Pancopia combines the Greek prefix ‘Pan,’ meaning relating to a group of people and ‘Copia,’ which is Latin for abundance or supply. The company was founded by Chief Executive Officer and Senior Project Manager Bill Cumbie, who has worked in wastewater environmental engineering for over 35 years with the Hampton Roads Sanitation District and 29 years with the multinational company CH2M. Wanting to develop new technology in research and development, Cumbie accepted an early retirement offer from CH2M, but it didn’t last long. Two weeks later, a new NASA project came out with an objective to recycle water on the International Space Station. Cumbie wasted no time in applying for the project and was successfully accepted, resulting in the founding of Pancopia. Locally, Pancopia is working with the City of Portsmouth and their water treatment plant, evaluating clarifiers and handling residual disposal. They’re also assisting the City of Norfolk with their lake aeration system, helping the city save money on their power costs and improving the quality of drinking water. Cumbie notes that only about half of current water treatment plants remove carbon and nitrogen (removal of nitrogen would stop algae blooms occurring in natural water), but they’re looking to retrofit systems to improve the water, save money and even generate a profit for facilities to switch to their system. “In the longer term, Pancopia is interested in developing sustainable solutions to environmental problems and mostly in the area of water and wastewater,” Cumbie shares. Working on projects at the Peninsula Technology Incubator with access to the National Institute of Aerospace laboratory facilities, Cumbie believes it’s essential for Pancopia to be based in Hampton due to the company’s access to resources and facilities. The incubator has also been able to provide one extra lab person who is part of Pancopia’s part-time staff to help with chemicals, testing and analysis. Starting the small business was much easier with help from the incubator, which added credibility to his proposal to receive a grant from NASA to undertake the large project. It’s also allowed for the freedom of research and development Cumbie has always wanted. Currently, Pancopia is in phase two of a $750,000 contract with NASA to develop a system for the space station to condensate wastewater and then recycle it into drinking water. “Right now, it costs $83,000 to bring a gallon of water into space, so it’s really essential that they recycle their water. Their goal is to recycle 95 percent of it, and they’re not near that yet, so our treatment is to develop that,” Cumbie explains. The company’s greatest achievement so far has been their success with the first phase of their NASA contract, as Pancopia exceeded any other system used in the past 15 years in the removal of carbon nitrogen for reusable water. “It was a huge success. 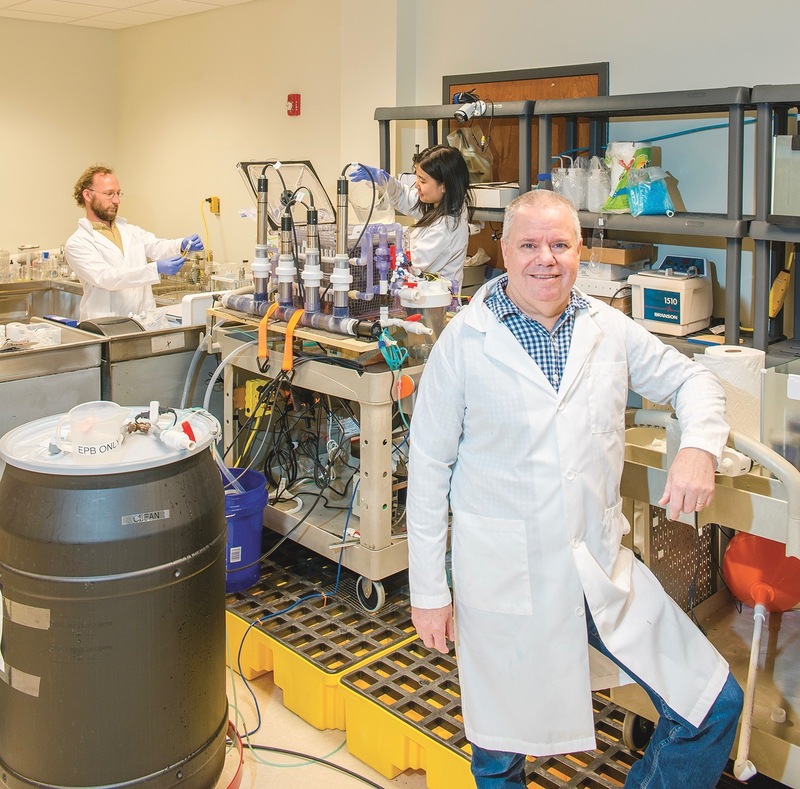 We were able to successfully freeze dry organisms, reconstitute them and use them in a system to remove the carbon nitrogen from the wastewater,” Cumbie says. One may think that working with large organizations such as NASA or the Navy might be overly ambitious for a small company of five to take on, but Cumbie says that they’ve made it as easy as possible for Pancopia. The greatest challenge they’ve faced has simply come down to finances, such as paying bills, taking care of health insurance and regulations. But, the company has coped with these challenges and continues to grow, having added additional lab space and analytical equipment to execute research.